The hand selected bunches of Merlot and Cabernet Franc from Whalebone Vineyard were separately de-stemmed, partially crushed and chilled to 2C into tubs each containing 0.9 tonnes. The tubs of Merlot and Cabernet Franc were separately tipped into a small airbag press and pressed straight to French oak barriques, 90% of which were new and the balance 1 use. In January 2015, the wines were clear racked from barrique and 56% Merlot and 44% Cabernet Franc were blended ready for bottling on 18th of February 2015. 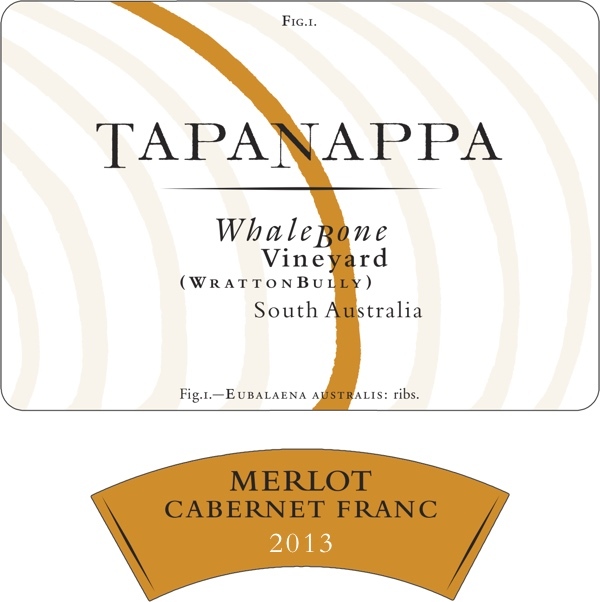 Tapanappa 2013 Whalebone Vineyard Merlot Cabernet Franc is absolutely typical of this unique blend and reflects its synergy with the special terroir of the Whalebone Vineyard. The wine is deep and vibrant in colour and the aromas are rich and ripe, with the hallmark Merlot Christmas pudding density. The Cabernet Franc provides a floral and leafy high note to the aromas and flavours and despite its ripeness this is an elegant wine with refined tannins.